Polar bear mother with two cubs on an ice floe in the Arctic Ocean. The Arctic Refuge is located in northeastern Alaska. Yet that’s just what the Trump administration would open the door to as it prepares for oil and gas drilling and moves to authorize seismic testing, a precursor to drilling in the Arctic Refuge. Earthjustice has long worked to defend the Arctic Refuge, which now faces the greatest threat in decades as the Trump administration barrels forward with plans for an oil and gas lease sale as early as next year. Members of the public have until March 13 to comment on a draft plan to hold a lease sale. Congress opened the coastal plain of the Arctic Refuge to industry leasing for the first time ever in December of 2017, by tacking a drilling provision onto a federal tax bill to avoid a filibuster. Most Americans are against drilling in the Arctic Refuge because the wilderness has extraordinary ecological value that warrants the highest safeguards. Bipartisan opposition has historically prevented industry from harming this cherished landscape, and recently a bipartisan group of House lawmakers introduced legislation to restore protections against Arctic Refuge drilling. Polar bears on the coastal plain will be especially vulnerable to harm from seismic operations and drilling. Proposed oil exploration activities pose substantial risks of death or serious injury to denning mother and cub polar bears, according to the analysis of Dr. Steven Amstrup, chief scientist for Polar Bears International. Polar bears, classified as marine mammals, are already struggling. Sea ice is vanishing, a consequence of warmer winter temperatures, and polar bears cannot survive without it. According to the U.S. Geological Survey, reduced sea ice could result in the loss of approximately two-thirds of the world’s polar bears within 50 years. The agency predicts Alaska’s polar bears will be “extirpated under current emission scenarios” — which means they will go extinct if nothing is done to address climate change. The Southern Beaufort Sea population has declined by approximately 40 percent in recent years, which has made it more important than ever that the bears can successfully birth and raise young. As ice melts away, polar bear mothers are increasingly going on land, to the coastal plain, to build their dens — and they are particularly vulnerable to disturbance while denning. The combination of having more polar bears on shore and more people conducting seismic testing operations means there will be more interactions between people and bears, resulting in greater risks to bears. 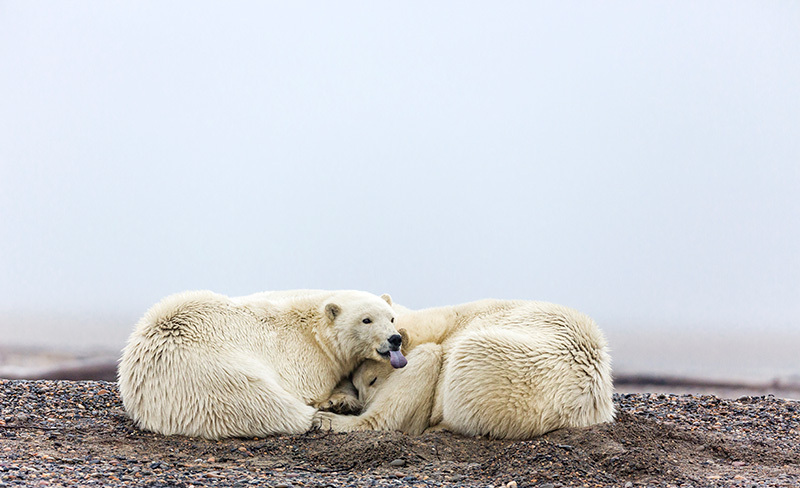 Mother polar bear (Ursus maritimus) and cubs rest on Barter Island near Kaktovik in the Arctic National Wildlife Refuge. SAE has submitted a petition to the federal government for “incidental take authorization” for polar bears. The word “take,” as defined under the Marine Mammal Protection Act, means “to harass, hunt, capture, or kill” a protected species. There are many good reasons to oppose oil and gas industrialization in the Arctic National Wildlife Refuge. It would destroy one of the last truly intact wilderness areas on Earth, an open expanse of public lands that for decades remained off-limits to drilling precisely because Congress recognized its extraordinary value. Greenhouse gas emissions from extracting and burning Arctic Refuge oil reserves would worsen global climate change, making life worse for future generations. It would also disrupt migrating caribou, in turn violating the human rights of indigenous Gwich’in people who rely on caribou as a primary food source. As the Trump administration and its friends in the oil sector prepare to shatter the Arctic Refuge with major industrial operations, the threat to endangered polar bears speaks volumes about the current administration’s disregard for wildlife and the public lands we all cherish.